4x4 Floor Scale for Warehouses 5000 lb. 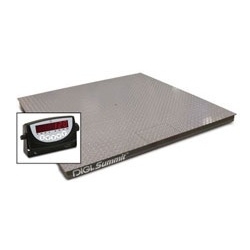 The Digi Summit with 120 readout has been a popular floor scale system for several years. It combines the proven performance of the Digi Summit Floor Scale with the 120 basic digital readout. The digital readout is calibrated to the floor scale at the factory in Rice Lake Wisconsin. The scale typically arrives on a pallet via LTL freight while the digital readout normally ships via UPS. The four feet on the floor scale are adjustable and there is approximately 20 feet of cable that connects the digital readout to the floor scale. The system is NTEP legal for trade 5000 x 1 lb. and is also available in a 10,000 lb. version as well.